The Iraqi government released a list of its 41 most-wanted people. The list translated from Arabic by The Associated Press. 1 — Izzat Ibrahim al-Douri, $10 million bounty. Vice president of dissolved Revolutionary Command Council. 2 — Mohammed Younis al-Ahmed al-Muwali, $1 million bounty. Former Baath Party member accused of funding and leading terrorist operations. 3 — Tahir Jalil Haboh, $1 million bounty. Former intelligence director and member of the Baath Party regional command. 4 — Saif al-Din Flayeh Hassan Taha al-Rawi, $1 million bounty. Chief of staff of the former Republican Guard. 5 — Adul-Baqi Abdul-Karim Abdullah al-Saadoun, $1 million bounty. Insurgent in Diyala province who shuttles to southern Iraq. 6 — Rashid Taan Kadhim, $1 million bounty. Leads insurgent operations in Anbar, responsible for funding terrorist operations in Diyala. 7 — Ahmed Hassan Kaka al-Obeidi, $200,000 bounty. Former intelligence officer and ex-Baath Party official. 8 — Muhdhir Abdul-Karim Thiyab Abdul-Kharbit, $50,000 bounty. Involved in "oil for food program," funds terrorist activities against Iraqi forces in Anbar and funds al Qaeda in Iraq. 9 — Omar Saabawi Ibrahim Hassan al-Tikriti, $50,000 bounty. Head of the former National Union of Iraqi students, chief of Saddam's Fedayeen, supports terrorism. Saddam Hussein's nephew. 10 — Rifaie Abdul-Latif Tulfah al-Tikriti, $1 million bounty. Assumed many posts under the former regime and was member of the former Baath Party, illegally transfers money across the border. 11 — Nihad Naji al-Ithari al-Dulaimi, $200,000 bounty. Former general manager in the intelligence. 12 — Hassan Hashim al-Dulaimi, $200,000 bounty. Secretary of the former finance ministry, an active former Baath Party member. 13 — Fawzi Mutlaq al-Rawi, leads a terrorist group inside Iraq, senior former Baath Party member, supports terrorism in Anbar. 14 — Abu Abdullah al-Shafie, $50,000 bounty. A leader in Ansar al-Islam group/Ansar al-Sunnah since the beginning of 2003, committed terrorist activities in Kirkuk, Nineveh, Diyala. 15 — Malla Halkord Ahmedi, $50,000 bounty. Head of Ansar al-Islam/Ansar al-Sunnah in Baghdad, he runs terrorist operations on a daily basis. A member in Ansar al-Islam before the fall of the regime, a member in the Mujahedeen Shura Council. 16 — Raghad Saddam Hussein, Saddam's daughter. Funds terrorism in Iraq, high officials in former Baath Party facilitate money transfers between her and the terrorists. 17 — Sajida Khairuallah Tulfah Hussein, Saddam's wife. Main source of guidance, logistic support, funds terrorism in Iraq. She has access to Iraqi riches stolen by Saddam. 18 — Maan Bashour, Lebanese Baathist. Has a long relationship with Saddam's regime. He recruits fighters in Lebanon to go to Iraq to support terrorist operations. 19 — Isam Khudhir Abbas al-Dulaimi, $50,000 bounty. Former director in the intelligence agency, he supports the Muhammad Army insurgent group. 20 — Ghazwan Sabti Faraj al-Kubaisi, $50,000 bounty. Senior former Baath Party member, staff major-general in the former intelligence service. 21 — Abdullah al-Janabi, $50,000 bounty. Cleric who supports and takes part in terrorism, he provides financial and moral support in Anbar. 22 — Ibrahim Yosif Turki al-Jubouri, $50,000 bounty. Commits terrorist acts in northern Iraq. 23 — Khalaf Muhammad Mukhlif al-Dulaimi (nickname Abu Marwan), former manager of "special projects," belongs to the former intelligence and after the fall of the regime he escaped Iraq with millions of dollars. Also funds, organizes and smuggles terrorists and weapons to Iraq. 24 — Abu Mtafa al-Shaibani, $200,000 bounty. Head of a terror network paramilitary located in Baghdad and southern Iraq. 25 — Ahmed Watban Ibrahim al-Hassan al-Tikriti, unspecified reward. Funds and guides terrorists, transfers money to terrorists inside Iraq, facilitates the movements of the terrorists to Iraq. Saddam's nephew. 26 — Munthir al-Kassar, unspecified reward. Has relations with the families of elements of the former regime, arms merchants. Supplies terrorists with weapons. 27 — Ahmed Abu Sajjad al-Gharawi, unspecified reward. Head of a terrorist group in southern Iraq. 28 — Mam Abdul-Karim, unspecified reward. Senior member in Ansar al-Sunnah, he is the main facilitator for the operations, funding and communications in north Iraq. 29 — Abdul-Hadi al-Iraqi, top leader of al Qaeda in Iraq and the Mujahedeen Shura Council. He is from Nineveh. 30 — Abu Ayyub al-Masri, $50,000 bounty. New leader of al Qaeda in Iraq. He is an Egyptian and former member in the Egyptian Islamic Jihad Movement. 31 — Saad Hamid Shihab, $50,000 bounty. Facilitates money transfers to terrorists in Salahuddin and Anbar. 32 — Raad Hamid Shihab, $50,000 bounty. 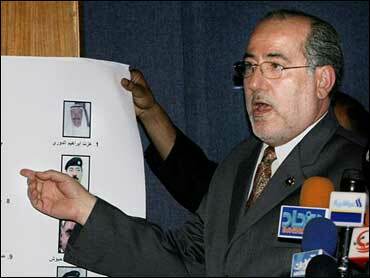 Senior former Baath Party official, facilitates money transfers to terror leaders in Saluhuddin and Anbar provinces. 33 — Muhammad Hisham Muhammad (nickname Mansour/Khadim el-Hsein), $50,000 bounty. Has links with Ansar al-Sunnah/Ansar al-Islam and bombmakers in Iraq, provides terrorists with bombs. 34 — Ahmed Muhammad Younis al-Ahmed al-Muwali, unspecified reward. Uses trade and travel as a cover to facilitate and fund terrorist activities. 35 — Sarhid Kadhim al-Janabi, active leader of many terrorist groups in southern Baghdad and the group involved in kidnapping and assassinating foreign and Iraqi officials. 36 — Ahmed Shawqi al-Kubaissi, group leader funding terrorist operations. He issues fatwas to kill army and police officers. 37 — Zuhair Abdul-Ghaffar al-Kubaissi, a terror leader in Baghdad. He issued a fatwa to kill Shiites and is funding hostile activities against Iraqi forces. 38 — Jamal al-Tikriti, high field leader in Omar Brigade. He attacks Iraqi forces in Baghdad with roadside bombs. 39 — Muhammad Fadhil Gharib al-Mashhadani, funds terrorism and facilitates terrorist operations in Diyala. 40 — Talib Yosif Zuwayed al-Issawi, known leader of al Qaeda in Iraq. A spiritual leader to the terrorist organizations. 41 — Sabri Khrebit al-Dulaimi (nickname Abu Ayyub), one of slain militant Abu Musab al-Zarqawi's aides. He had strong links with Iraqi intelligence, supervises terrorist networks.